These posh crisps are fried in pure sunflower oil using new technology that means less fat is absorbed. As a result, these crisps have around half the fat of conventional ones – and also boast a lower salt content. But be warned, they’re not much lower in calories! A 30g packet contains 134 calories, 5.2g fat and 0.2g salt. They’re available in four flavours: Sundried Tomato, Garlic and Basil; Sour Cream and Chives; Sea Salt; and Mozzarella and Red Onion. Find them in Waitrose, Booths and independent stores priced from 39p for a 30g packet and £1.49 for a 100g bag. Weight Watchers has added three new thin and crispy pizzas to its existing range – Three Cheese and Roasted Tomato (485 cals, 5.4g fat), Ham and Pineapple (486 cals and 4.9g fat) and Pepperoni (490 cals. 5.4g fat). Find them in Asda and for a limited time in Morrisons, priced from £2.28. ‘Less than 3% fat’ – these products contain less than 3% fat and can help with weight loss as part of a calorie controlled diet. ‘Healthier Option’ – these products have less calories, salt and saturates than the standard products. ‘Plus’ – these products have extra ingredients added such as prebiotics, probiotics or omega-3 fats. 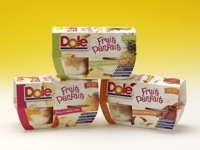 This new pot dessert combines fruit with a flavoured crème and is available in three varieties: Pineapple and Coconut Crème (114 cals and 2g fat per pot); Peaches and Vanilla Crème (109 cals and 2g fat); and Apples and Caramel Crème (121 cals and 2.2g fat). Available from Sainsbury’s, Somerfield, Morrisons and Asda, priced £1.99 for a pack of four. Fancy a change from your usual low-cal products? Then check out Waitrose’s Perfectly Balanced range that’s recently added around 20 new lines, including ready meals, baked products, dairy products and meat, fish and chicken dishes. Fruit2Day is a new fruity snack that you both eat and drink! It comes in a bottle and contains a mixture of juices, plus real fruit pieces that you need to chew. It’s fat free, packed with vitamins and is available in three varieties – Mango and Peach (115 cals per bottle), Strawberry and Orange (111 cals), and Pineapple and Banana (113 cals). Available from major supermarkets priced around 99p for a single bottle and £1.89 for a pack of two. Tesco has launched two Low Gi Cereal Bars available in Almond & Red Berry and Apple & Blackberry flavours. They contain around the same amount of calories and fat as other cereal bars – 135 calories and 6.4g fat per bar – but claim to release energy more slowly so you’re less likely to get the munchies. Be warned though – they’ll shift pounds from your bank balance too, at a hefty £3.99 for a pack of five. Look out for two new delicious low-fat frozen yogurts from Ben & Jerry’s – Cherry Garcia (160 cals and 3g fat per 100g) and Chocolate Fudge Brownie (180 cals and 2.4g fat per 100g). Despite containing just 3% fat, they taste more like ice cream than yogurt and will certainly satisfy sweet tooth’s. Priced from £3.78 for a 500ml tub. Forget E-numbers, artificial preservatives and colourings. M&S is the first retailer to launch an entirely additive-free range – Cook! – that includes around 200 products ranging from soups, casseroles and fish dishes. Look out for M&S’s ‘Eat Well’ logo on packaging, too – products with this logo are nutritionally balanced and healthy and incorporate foods from the Cook!, Healthily Balanced and Count on us… ranges. You can follow a healthy weight loss diet using the food diary and database tools in Weight Loss Resources. Try it free for 24 hours.